The continuing cultural genocide at BBC Radio 3 has forced me to experiment with alternative music sources in the car. My Overgrown Path company car (106,000 miles on the clock and about to make its twelth trip to mainland Europe!) doesn't have an auxiliary jack on the audio system, but it does have good speakers and a decent amplifier. So I bought the Griffin iTripAuto seen together with my iPod in the photo above. The iTrip concept is very simple; it takes the iPod output and broadcasts it as a low power signal on a vacant FM frequency to the tuner in your car stereo. Power for the little transmitter is supplied by the car cigarette lighter and it takes just a few minutes to get working. My expectations were not high, after all the iTrip costs less than £12 in the UK. But the performance is surprisingly good, and is certainly far better than acceptable. Yes, there is low level background noise, and it is not ideal if you exist on a strict diet of clavichord recordings. But I am more than happy to accept a little background noise in return for being rid of BBC Radio 3's vacuous presenters and bland programming. Life on the road with the iTrip has been a real revelation, although there are some relatively minor wrinkles. It does not recharge the iPod Nano, although other iPods are recharged; but given the exceptional battery of the Nano that is not a problem. You need a passenger to act as DJ on long journies unless you playlist your music in advance. But the shuffle mode is always there; on the trip back from the Bern Ballet at Snape it entertained us with a particularly felicitous sequence of Gregorian Chant from Solesmes, followed by Dylan, then one of Silvestrov's Stille Lied. Probably the biggest problem is that the iTrip is not legal in all countries. No problem in the UK, but it is outlawed in FM frequency challenged France. We will be spending a fair amount of the summer away from the computer and in France with the car. So I should be able to report back first-hand on how strictly that particular law is enforced. 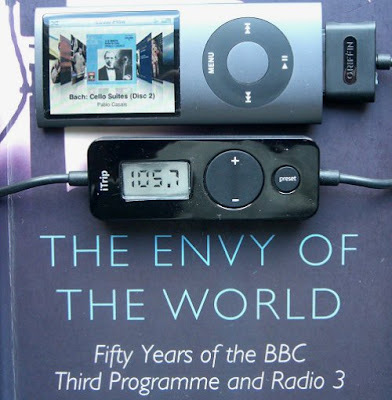 * Background to my header photo is The Envy of the World - Fifty Years of the BBC Third programme and Radio 3 by the much-missed Humphrey Carpenter. Given the title it is quite appropriate that the book is out of print. Read more on renaissance man Humphrey Carpenter here. I can only offer in return an intermediate case - a pseudo-cassette with a connector off one end. Insert the "cassette," connect to a portable CD player, tune FM to the defined frequency, and play CD's. Yes, it worked, but I recall the wires and the portable CD player as being a perishing nuisance, always slithering to somewhere you didn't want them. Scott, yes, I had one of those as well. I can still remember driving on my own across France at night in 1998 in a Renault Laguna. At around 3.30 am there was a thunder storm of biblical proportions as I was passing Le Mans on the autoroute. I gave that solution a miss in favour of a wireless solution! I bought an adapter for my Mazda3 for around $100 back in 2004, and it was absolutely worth the money. Dunno how well FM transmitters work in the UK but the sub-$50 ones are just a waste of money in US cities. Some assembly required (I had to take the front faceplate to the center console off, plugging the adapter in, and figuring out how to make the aux input accessible). Richard, thanks for that. I will certainly investigate the auxiliary adaptor. (It's not a company car - that was a poorly delivered joke). One advantage of living in rural East Anglia is that there are not many FM stations. However I understand 88.5 and 88.3 FM are relatively clear across the UK. It will be interesting to see how the iTrip works (illegally) in more crowded France the week after next.